There is so much to explore in the great outdoors near Santa Fe. When you stay at our luxury bed and breakfast in the heart of the city, you’ll appreciate a nature escape! And the Valles Caldera National Preserve is an incredible destination for hiking, biking, and more. The highlight of this nature oasis is the volcano, which erupted about 1.25 million years ago to create a 13-mile circular depression that is now the preserve. Wander through expansive mountain meadows as the breeze rustles through your hair. Explore the abundant wildlife and plantlife growing by meandering streams. And discover why the Valles Caldera National Preserve is such an incredible destination near Santa Fe. For more information on where to go hiking during your stay in Santa Fe, download our free vacation guide. It features everything from the Valles Caldera National Preserve to city walking tours! Read about other great outdoor adventures here. Escape to the quiet retreat of the Valles Caldera National Preserve for a peaceful morning or afternoon in nature. If you’re looking to go on a hike, there are some great trails in the preserve. One is the Jemez River East Fork Trail. This easy and fun route features a rock climbing and bouldering paradise as well as plenty of pets along with their owners enjoying some exercise. The views along this pathway are quite stunning, following the bubbling river and passing some exquisite rock formations. The 3-mile round trip is known as one of the most beautiful hikes in the area, so bring your camera for some spectacular photographs! Another hiking route is the Cerro La Jara Loop Trail. This short path is ideal for someone looking for a quick jaunt through the lowland terrain before continuing on to other activities. The Valles Caldera is actually one of three active calderas in the United States. It encircles a field of volcanoes, the largest being Valle Grande. This massive volcano is almost 10 kilometers long and six kilometers wide, making it the star of the landscape. A magma chamber flows below the surface of the charming grasslands you will see stretching before you in the preserve. At one point, these lands were covered with lava when the volcano erupted almost 1.2 million years ago. At this time, ash and lava covered the area, contributing to the flatlands and surrounding Jemez Mountains as the earth sank to form the Valles Caldera. Now, the serene meadows and surrounding woodlands look quite peaceful compared to their days of formation! 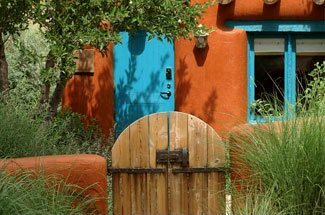 Retreat to Four Kachinas for a restful getaway after your outdoor adventures! 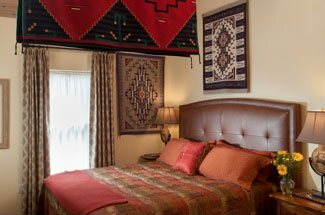 Our charming Southwestern inn is a cozy alternative to traditional, cookie-cutter hotels. Take advantage of our modern amenities and gourmet breakfast, as well as proximity to the scenic downtown center. Enjoy our one-of-a-kind touches, such as original Native American and Spanish Colonial artwork. And all are highlighted by our building’s traditional New Mexican architecture. You’ll love stretching out with a good book on our quaint patio or soaking away your worries in your private tub. However you want to relax, our bed and breakfast will help you do it during your Santa Fe vacation!